It would seem like a challenge to piece together a thoughtful and engaging film around the quietest of games—something more entertaining to do yourself than to watch. But in Puzzle, director Marc Turtletaub manages to find a dramatic tale to weave around the game itself without turning puzzles into a set dressing for an indie drama of rediscovering passion and purpose. He knows that the game itself has a more contemplative edge and lets the audience enjoy that sense of reflection and tranquility rather than force us to be invested in whether or not a 1,000-piece puzzle can be assembled in record time. This hobby perfectly fits the character of Agnes (Kelly Macdonald), but her homemaker lifestyle does not. Her mechanic husband, Louie (David Denman), is oblivious to her masked loss of self, her oldest son is far too cocky, and her youngest son is depressed about not living up to dad’s standards. She tries to keep the home happy, even if she’s not. But only when she’s assembling a puzzle—after the chores are done and everyone is out of the house—does she feel a sense of happiness that is more genuine than required. There’s a peace in the silence, all too soon replaced by a frantic rush and a forced smile to sustain the household, her husband nagging her about cheese. Agnes’s desires take her down a unique route when she ventures into a puzzle shop. While seeking the most challenging of the lot, she spots an ad for someone seeking an expert puzzle player. 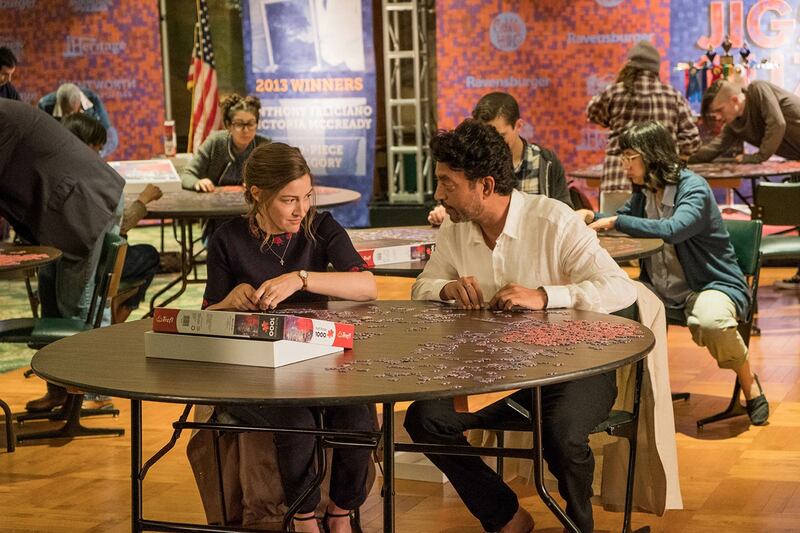 The one seeking a partner is Robert (Irrfan Khan), a wealthy man who takes his puzzles very seriously. Here is where the film could have taken a nosedive, considering Robert’s leading of Agnes into the world of competitive puzzles and acting as the romantic love interest worthy to have an affair with. Thanks to Khan’s performance and charisma, however, his entrance never seems silly, even when he makes the obvious play of furthering the relationship by answering the door in his bathrobe. Much like Agnes, he chooses to focus and contemplate just as much, to a degree that he’ll understand her far more than Louie. But Puzzle goes the extra mile to ensure it’s more than just a romantic fling across tables of scattered puzzle pieces. The film takes the time to define it supporting players. Louie isn’t just some cartoonish oaf of a husband written to be left in his greasy hell. He is at a point in his life when he believes all is happy and right because nobody dares speak back to him for being a hardworking and decent blue-collar man. His rule is so firm that Agnes lies about her meetings with Robert on both a professional and sexual level. Their kids, similarly, are at complicated times in their lives, deciding where to go next. One is thinking about going to cooking school while the other wants to travel around the globe, each of them coming from a different angle when they’re presented with the future. There are plenty of moments where Puzzle could derail. Robert could turn into a manipulative jerk, Louie could play a childish game of spoiling the kids in a predivorce ritual, and Agnes could go nutty with her puzzle obsession. But never does the film go too far, instead gently pumping the brakes before it goes over that cliff of plausibility and taking a moment to breathe and find that purpose—those few missing pieces we frustratingly scan for. And from that, the seemingly impossible was accomplished: a meaningful and emotional drama about people putting together puzzles.